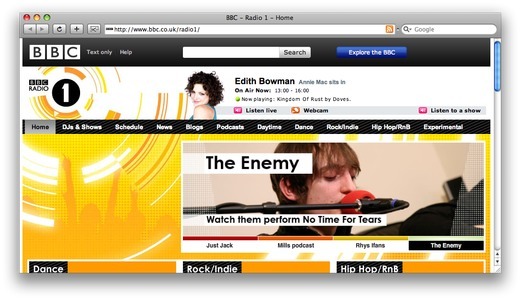 Posted on 3rd April 2009 — Gareth Edward asked how to achieve the effect on the latest BBC Radio 1 website, where the mouse rolls over the image block, tabs slide up and the image zooms a little to reveal more of the picture. QuickTime version is approximately 60Mb, flash version is streaming. The first thing I noticed about the effect is that it’s done in Flash. I’m a big believer in knowing where Flash has it’s place: the high end of the effects within browsers (amongst other places). When you roll over the image, it zooms out slightly to reveal more of the image. Notice that it also keeps the top position static. The navigation slides in to view from the bottom of the box, and mousing over the link will trigger showing a different image. The images automatically change with a swipe effect. I’m going to set aside the 3rd effect for now (perhaps I’ll do a screencast on it in the future) and focus on the first two. I’m still in two minds as to whether this should be a background image. The image certainly doesn’t add any value from a content point of view, so without CSS I think it looks right, but I’d be open to hear your opinions. When these images are created they need to have their size increased by a defined percentage (which we’ll make a parameter), so that when we roll over, the image is resized down to it’s original size, giving the impression of a zoom out. Given that we are going to stretch these images across the total height and width of the panel, it also means we need to wrap the content that’s initially in the panel in an element with a higher z-index to make sure the actual content can still be seen and used. By default the jQuery slideUp method hides content, and slideDown reveals the content by expanding element downwards. As for the CSS, as an experiment, I’ve used EMs throughout the CSS – there’s no reason why you can’t use PXs. I was just interested in seeing the example being zoomed by the browser. I’ve set the body font-size to 62.5% so that 1em is equal to 10px. I’m going to give you each part separately, then you can see the whole thing put together in the completed example. As I’m trying to make a plugin, I’m saying that I don’t know anything about the images or height or width of the panels. We need to loop through each panel, take the background image and create a new image with that url. Once that new image is loaded, we’ll pull out the height and width, work out the zoomed in height and width (which will be a percentage larger than the initial size), strip the panel of it’s background image and then insert the new image in to the panel. Phew! That’s sounds like a lot! Let’s take a look at what’s happening in this code. The panelIds variable contains a string such as: #one,#two,#three – since this is the hash on the href the tab links, which we immediately capture as a jQuery instance. Next, we loop through the $panels to convert the background images to foreground images. This is a regular expression that captures the background image. It’s written to try to handle different cases in that the url could be plain, wrapped in single quotes or it could be wrapped in double quotes. We test if we did successfully find the background image (which you may argue we don’t need since this plugin has a very specific purpose), and if it was found, we’ll create a new image. This is to ensure the contents appears above the image – specifically notice the z-index: 2. The very last action we perform is to capture the image in the images array. This will be used later to zoom the images in and out. This means we can retrieve this data later on. I’ve created a separate function to handle the zooming in and out of the image. This is because it will be called from two different places with only one single different – which variable to use to set the CSS – either ‘fullView’ or ‘zoomView’ which we set just above. In this function we loop through the images that we captured in the images array. From there we say if the image is visible (i.e. it’s the currently active panel), then animate it’s CSS properties (either zooming out or in – this is defined by the zoomType). If the image isn’t visible, we need to just change the CSS properties without the animation. This is because when the user switches to a different tab, the image must be in the same zoomed state as all the other panels. The hover over is fairly simple, we stop the effect from running on the $tabs to prevent it from jumping and down madly, and we animate the height to a pre-captured height (which would happen in the initialisation phase). Hover off is slightly different. We do the same, animating down to zero, but then we use a callback function to hide the navigation, this is to ensure it’s completely hidden once the effect has finished (because in my example, I’m using a border, and animating the height to zero would leave the border visible). I’ve added a simple 100ms timeout to say if the user is over the tab, now show that panel. Since I’m using setTimeout, I need to capture a copy of the current tab link, because the this keyword inside of the setTimeout is actually a reference to the window object. With all my code now in place (there’s a few initialisation items I’ve not covered in this tutorial, but should be covered in the screencast the effect is now ready to be used. Have a play with the zoom tabs effect, let me know what you think – particularly so if you think there’s a better name for it!